A comprehensive tour taking enthusiasts to the most sought after places in South America. A itinerary designed to give you the best of each place along with comfort. 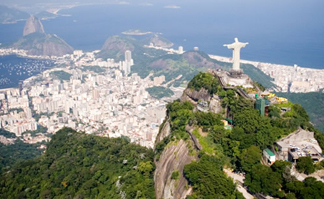 Take flight from Mumbai to Rio de Janeiro. On arrival, pick up and transfer to your hotel for overnight stay on bed and breakfast basis. Today you have a guided tour of Santa Teresa in Rio de Janeiro. See this great neighborhood accompanied by your guide and go on a trip to the past as you also visit the historical center of Rio, Praça XV, Teles Arches, France Brazil House, Arcos da Lapa. Today we will have a Corcovado tour after which proceed for Sugarloaf Mountain. Evening proceed for the Platforma show with dinner. The platforma show brings to you the Salsa and Carnival of Rio as you enjoy the dinner. Early morning check out & transfer to airport for flight to Manaus. Pick up and transfer to Ariau Amazon Tower Hotel. Morning activities at the lodge, then transfer to Manaus for meeting of the rivers. After dinner transfer to airport for flight to Iguassu. On arrival in Iguassu, transfer to your hotel. Check in and start your tour of Brazilin side of the falls & then the Macuco ride. After breakfast proceed for a helicopter ride which gives a perspective as you can see both the Argentine and Brazilian side of the falls. Post the helicopter ride you will cross over on to the Argentina side of the falls. The bridges are closer to the falls on this side and one can also go closer to the Devils Throat from here. Then proceed for a short city tour with Tango and dinner included. Today you will be driving from El Calafate to Puerto Natales in Chile. This is a very scenic drive. After breakfast transfer to airport in Punta Arenas to Santiago de Chile. H2 8 – Punta Arenas 1415 Santiago 1740. You will have to wait at the airport for next flight. On arrival in La Paz take connecting flight to Colchani. Remarks: Wear trekking shoes, hat, sun glasses, sun screen, light but warm clothes. After Breakfast full day excursion tour to Sacred Valley of the Incas. Visit the village of Pisac and attend the local agriculture open market where artisans from all over the area congregate to sell their orafts. Buffet lunch at Countryside restaurant. After lunch proceed to the north to visit Ollantaytambo, a fortress built during the Inca Empire, an excellent sample of military architecture. Vegetarian dinner at Incanto restaurant. Overnight stay at Cusco. Get up early in the morning and transfer to Poroy Train Station at 0545 hrs. Depart from Vistadorne Train at 0640 hrs to Machu Picchu. Reach Machu Picchu at 0952 hrs. Upon Arrival take a 30 mins bus ride totha Lost City of Machu Picchu. Machu Picchu is eye tantalizing tribute to man in harmony with nature. It is located high above the clouds. The city’s street, temples, and staircases spread across a jungle ridge that eventually plunges more than 300 meters into the treacherous water of the Rio’ Urubamba below. Dinner & Overnight stay at Machu Picchu. Take Breakfast at Machu Picchu and proceed for tour to Huayna Picchu. Take lunch and transfer to Cusco by Vistadorne train at 1520 hrs. Reach at 1950 hrs. Take dinner at Maikhana restaurant and transfer to hotel. Overnight stay at Cusco. Proceed for tour of Colonial and Modern Lima. You will be visiting Government Palace, the City Hall and the Cathedral at the Plaza Mayor, visit 17th century San Francisco Convent, short tour to modern districts of San Isidro and Miraflores and enjoy the magnificent view of the Pacific Ocean. Take lunch and then to Larco museum after which transfer to airport for flight back home. Upon arrival, transfer to hotel in Cusco. Take Indian lunch at Maikhana restaurant. In afternoon, city tour of Cusco & nearby ruins. Start with a walking tour throught the Cathedral. Visit Qorikancha or Sun Temple. Continue to Sacsayhuaman Fortress with its very impressive beauty, the amphitheatre of Q’engo, Puca – Pucara (or Red Fort) situated on a hill with superb views over the surrounding countryside and finally the Inca bath’s of Tambomachay with their water fountains. Buffet dinner with folkloric show at Tunupa restaurant. Stay Overnight at Cusco. Airfare on economy class at prevailing rate as per itinerary. Above tour with English speaking guide at all places with private vehicle. Extra cost incurred due to cancellation, missed connection of any mode of transport etc not part of the quote.